Research shows that dairy increases the risk of developing prostate cancer. If you are a yogurt fan, you don’t need to eliminate yogurt from your diet— rather, try a plant-based, dairy-free alternative. There are many different kinds making their appearances on grocery stores throughout the U.S. If possible, try to get a unsweetened version of these yogurts— look for no added sugar in the ingredient label. To naturally sweeten your yogurt, add in fresh, ripe fruit! walnuts, ground flax, or any other nuts or seeds are optional. 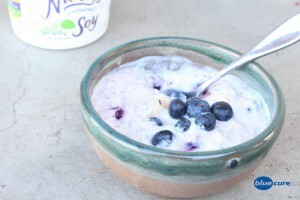 In a bowl or container, combine the yogurt with the chia seeds. Add more liquid if using more chia seeds to thin out the mixture. Allow to set for several minutes. Wash the berries (if fresh) and slice the banana. Add these to the yogurt bowl. Enjoy right away or allow it to soak overnight. Some unsweetened yogurts are a bit more tart, so soaking overnight is recommended so that the berries and the banana will infuse sweetness into the yogurt. Frozen berries do a really great job at this! Top the parfait with any additional healthful ingredients you desire, such as toast walnuts, sliced almonds, coconut flakes. *If you find another unsweetened brand (no sugar added), let us know!